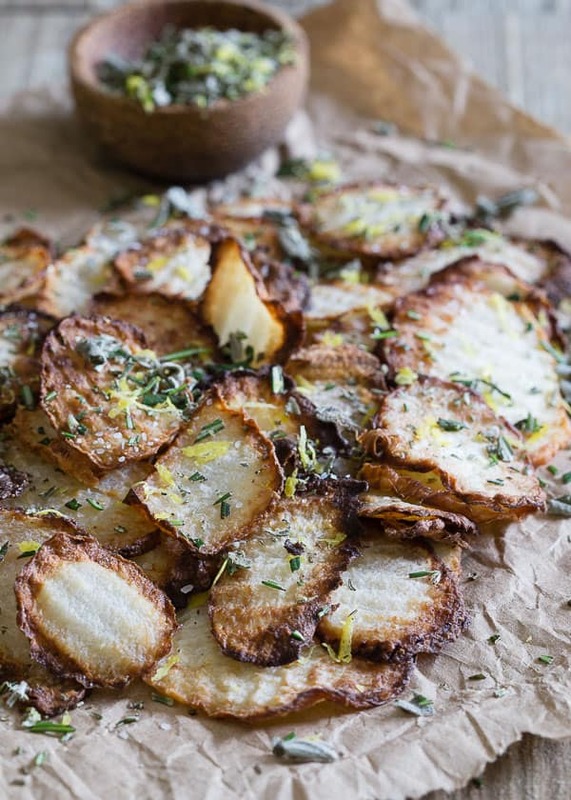 These fried jicama chips are tossed with fresh herbs and citrus zest for a deliciously crunchy alternative to potatoes. I seem to be having a mental block when it comes to these jicama chips as I’ve referred to them as parsnips no less than 5 times. On my grocery list before I even made them, parsnips. When I was texting people while making them, also parsnips. When I talked about how good they were, parsnips. And lastly, when I was editing the pictures yesterday to share with you today, parsnips. Luckily, my brain started working again before naming the post otherwise that could’ve be awkward. Funny thing is, I don’t even really like parsnips! I mean, they’re ok but one bad experience with an attempt at nut butter parsnip fries a couple of years ago was enough to kind of turn me off for awhile. So, I have no idea why my brain keeps confusing jicama with parsnips. They don’t even look alike and they sure as heck don’t taste alike! 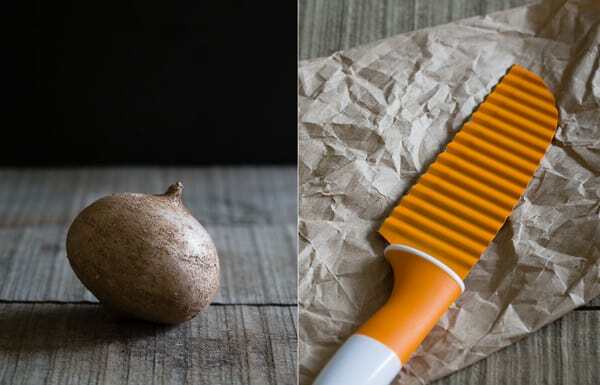 Parsnips epitomize a root vegetable and jicama is more like a water chestnut with it’s fresh crispiness. I know you’re probably thinking, “um, the only time I’ve eaten jicama is in those lame store bought veggie trays with the nasty ranch dip in the middle” and my goal today is to push those far out of your mind and convince you to fry it up in chip form. As a Crisp Ambassador, they sent me a bunch of fun cooking tools to play around with a few months back. And while I’ve enjoyed them all, I have to say, the wavy knife is by far, my favorite. Crinkle cut stuff is just more fun. I don’t know why, it’s just fact. Just like waffle fries beat traditional fries (hence my Chick-fil-A obsession), a few ridges in whatever it is you’re slicing makes eating it that much better. I’ve used it on potatoes, on beets and pretty much anything else conducive to slicing and roasting and figured it was time to get my fry on with it next. Because of the freshness factor going on with jicama, I thought a citrus herb seasoning would go really well with the crispy chips after they’re fried up in some coconut oil. 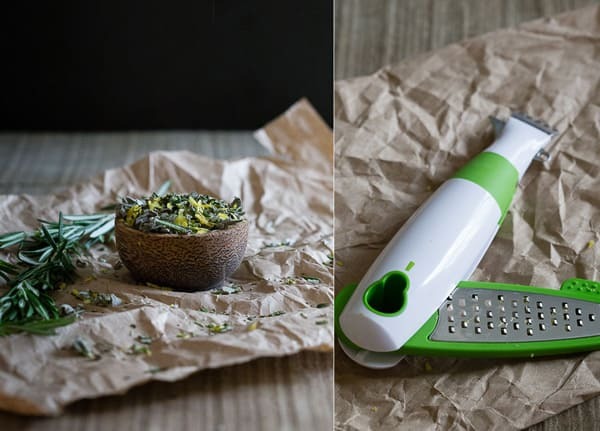 A quick chop of whatever fresh herbs you have on hand (although I’m quite partial to rosemary), some lemon zest thanks to the 4-in-1 zester, a good dousing of kosher salt and you have the perfect seasoning to toss with the hot chips. With Cinco de Mayo coming up and jicama being a plant native to Mexico, it’s only fair to add this to your party plans. Move over, guacamole! Heat enough coconut oil so that there is a thin layer (about ½ an inch) in a large, heavy bottomed pot over medium-high heat. Once hot, add jicama slices and fry until golden on each side. Remove jicama from pot and transfer to a paper towel lined plate to drain. 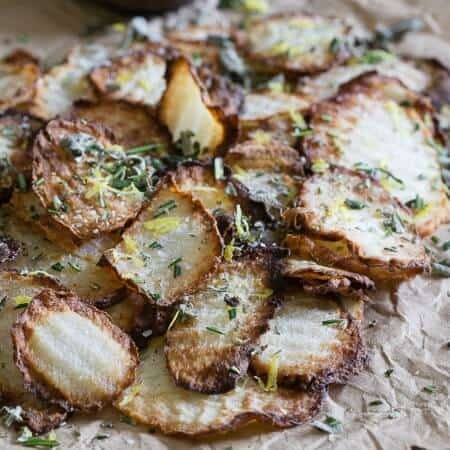 Sprinkle salt, herbs and zest all over chips while still hot. *This post is sponsored by Crisp Cooking. All content and opinions are my own. I love jicama, it makes the best chips. Digging the citrus herb seasoning you have going on! I need that wavy knife in my life immediately! You could have fooled me that these were not potato chips! I fell in love with jicama chips on my lsat trip to Mexico and I can’t wait to give these a go! Isn’t it funny how our brains can missfile words like that? My daughter used to get the words Pinecone and Scone confused. It was so funny to hear her ask for a pinecone for snack when we went to the bakery! BTW, I want to put that herb zest mix on pretty much everything! Dang these look SO good. I am a potato chip freak but I would gladly takes these instead! I would have never thought to make Jicama chips! 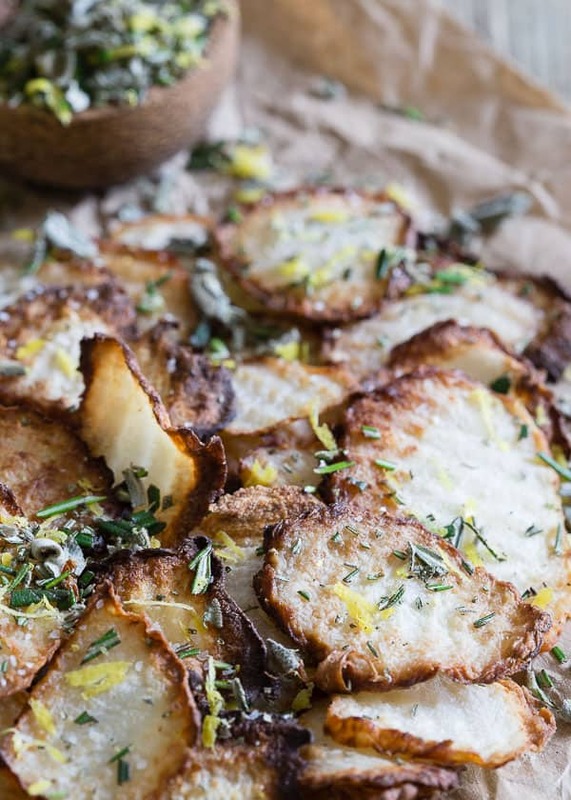 I love Jicama and these look totally awesome! I cannot wait to try it! Well, I actually love to eat jicama with lime and chile piquin (that the way you eat it in Mexico). I am from Mexico although I live in Vancouver, BC. I have never imagined having jicama chips, it is definitely something I should try. I am always looking for healthy snacks and this looks like a great option. This sounds interesting and yummy! I want to try them! The perfect healthy snack, I’d mow all of these! I am a fan of jicima, but have never had it in a chip form. This looks wonderful!! Jicama chips…intriguing! And I would totes put that wavy knife to some good use! How long do they stay crisp? I would want to make a weeks worth at once. They won’t stay crisp that long. If you want to prepare ahead, I would suggest cutting them into “chip” shape and keeping refrigerated until you want to eat them and then fry them on demand.